Currently within the Central Florida Collaborative of the National ECELC Project, there are 20 Orange County Head Start (OCHS) centers, which serve three- and four-year-olds in a variety of settings. Some Head Starts are located in community centers and others are on public school grounds. The Head Start centers range in sizes from one classroom to ten classrooms. All centers have completed three of five full-day learning sessions for the collaborative and received coaching and technical assistance around best practices in healthy eating and physical activity, which will continue through June 2016. OCHS Administration decided that each center will establish a vegetable garden. Gardening with young children increases outdoor physical activity, nutrition education, healthy eating and family engagement. The collaborative trainer worked with the Orange County Extension Office to propose a project. The Board unanimously voted “yes” to purchase and provide seasonal seeds for two planting seasons. A Master Gardener will be matched with each of the 20 Head Start centers to encourage ongoing gardening and fresh vegetable planting. Currently all 20 centers, which includes 85 classrooms and more than 1,500 children, have been impacted by gardening. 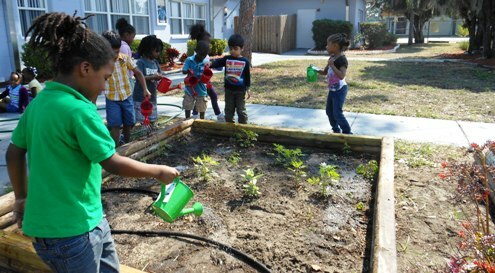 Arlington Christian Academy in Jacksonville, Florida, is building an outdoor classroom where children will have the opportunity to not only learn about growing food but also to increase their consumption of fruits and vegetables. Infants and toddlers are often thought of as “too young” to be involved in gardening, but they can be engaged through watering, harvesting, digging and exploring.